I’m very excited to have been asked to give a talk and run a workshop at the forthcoming Just Festival Westminster, taking place in London from 10th – 21st June 2015. This workshop is a combination of a short illustrated talk and a hands-on cookery session. Inspired by Barbara Wheaton’s amazing classes on approaches to reading historical cookbooks, I’ll give a brief presentation on some of the ways we can think about texts and images that help to draw out the maximum of information and historical context. Then, the class (12-15 people) will divide into small groups. Each group will be given a C17th or C18th recipe that I have redacted for the modern kitchen, and the ingredients and equipment to prepare it. Once we’ve all cooked, we’ll eat and discuss the food together, seeing what a hands-on approach to research and a convivial environment can do for our understanding of the food, cooking and eating of the past. David Reykart. 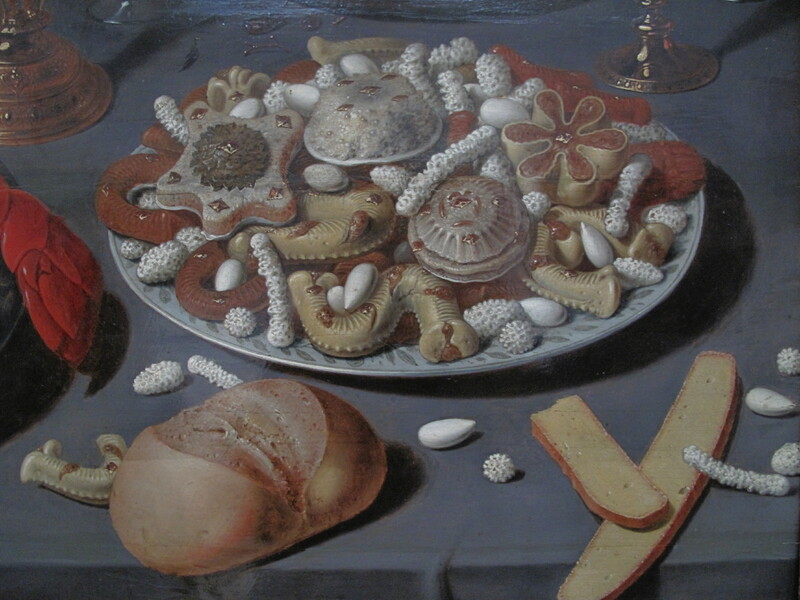 Detail from Still lIfe with Lobster (c. 1620-30). In Royal Museums of Fine Arts of Belgium, Brussels. It’s not only Magna Carta’s 800th birthday this year – it’s also the 800th anniversary of the Lord Mayor’s Show! The City of London is producing a lavish book about the whole event, which will be published to coincide with the 2015 Show in November. This talk builds on the research I did for a short piece in that book, giving me the chance to tell a few of the stories I didn’t have room for there, and talk about the food and the pageantry in a bit more detail – illustrated with some fabulous images found in the London Metropolitan Archives. 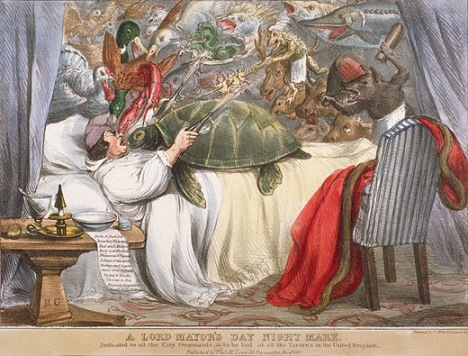 Fatal Effects of Gluttony: A Lord Mayor’s Day Nightmare. Lithograph by M.G. (1830), at London Metropolitan Archive. You can take a look at the whole programme here, where you will also find links for booking by Eventbrite: Just Festival Westminster. I do hope I’ll see some familiar faces – as well as make some new friends at either or both of these events.